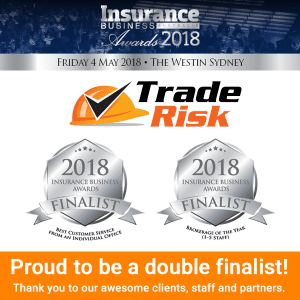 Trade Risk is very proud to be a double finalist in this year’s Insurance Business Awards. To be a national finalist in one category would have been amazing, but to get the double is very special. There are seven finalists in each category, covering all of Australia. Now we do have more than five staff here at Trade Risk, but only five who work on the general insurance side of the business, which means we are still eligible. The initial nomination process involved a 550-word submission for both categories, and once we were confirmed as a finalist, we had to put together a far more compressive submission of thousands of words. It was a time-consuming process, but it does make you put a lot of thought into what we do as a business and how we help tradies with their business insurance. On one hand we are surprised and humbled to be finalists in these categories, but on the other hand, we know we put everything into doing the best job for tradies and shouldn’t be surprised to be among the best in Australia. Now we sit back and wait for the big gala awards dinner in Sydney next month. A couple of our team members will be attending and crossing their fingers for a win! Thank you to our loyal clients, our fantastic industry partners and our awesome team for making Trade Risk what it is.